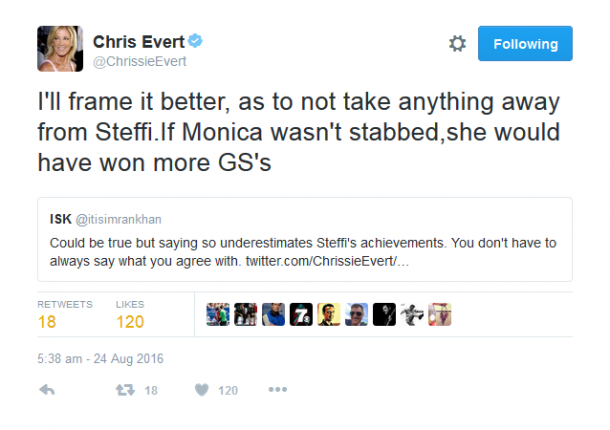 Evert revealed her thoughts on Twitter, which suggest Steffi Graf would not have won as many slams, ahead of Serena Williams’ quest to break Graf’s record and win her 23rd Grand Slam title. 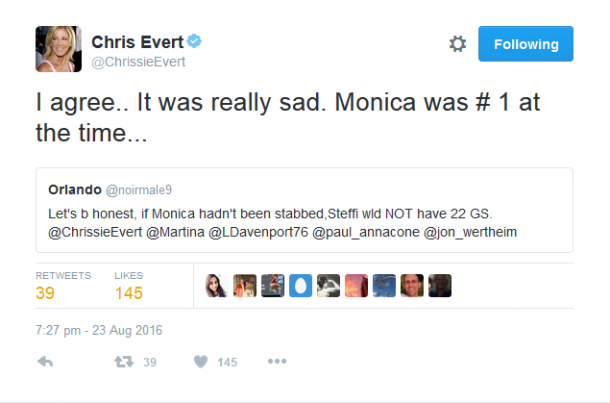 Chris Evert, widely considered one of the greatest tennis players of all time, has said on Twitter that Monica Seles would have won more slams if she had not been stabbed, suggesting that Steffi Graf would not have won as many. The former world number one’s comment comes ahead of Serena Williams’ attempt to win her 23rd Grand Slam singles title, and break Graf’s record for the most slams in the open era at the US Open. Evert originally responded to a fan’s comment on Twitter about the controversy, saying it was “really sad” that Seles, who was the world number one at the time, was attacked. When Seles was stabbed on April 30th, 1993 in Hamburg by an obsessed Graf fan, Gunter Parche, when leading a quarterfinal match against Magdalena Maleeva, the then-Yugoslav had won seven of the last nine Grand Slam tournaments, missing Wimbledon in 1991 and losing in the final to Graf in 1992. 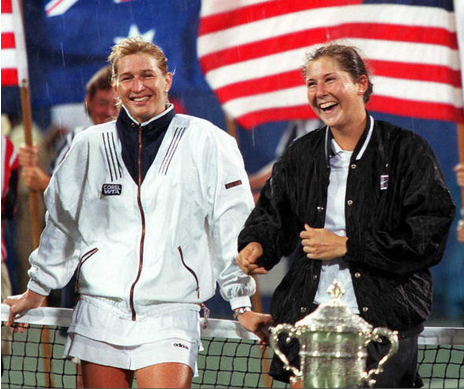 In the absence of Seles, the dominant player at the time of her stabbing, Graf won six of the nine Grand Slam titles available, and took five more titles after Seles returned; Seles, who would later compete for America, just won one slam after she returned to the tour. The recent interest in the German’s 22 Major titles comes as Serena Williams looks to break the record by winning an astonishing 23rd slam title. The American, who, after a year of waiting, equaled Graf’s record after beating Angelique Kerber in the Wimbledon final, is the favorite heading into the US Open and is the top seed, though she has not played since her loss to Elina Svitolina in the Olympics. 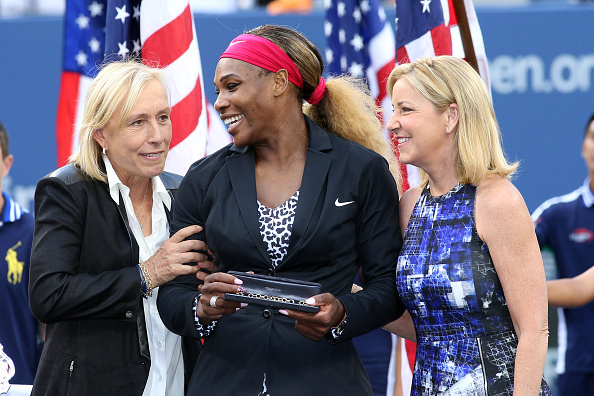 Williams was congratulated by Graf after equalling her record, whilst, just two years ago, received a special presentation from Evert and Martina Navratilova after the US Open triumph which saw her match their 18 Grand Slam titles.